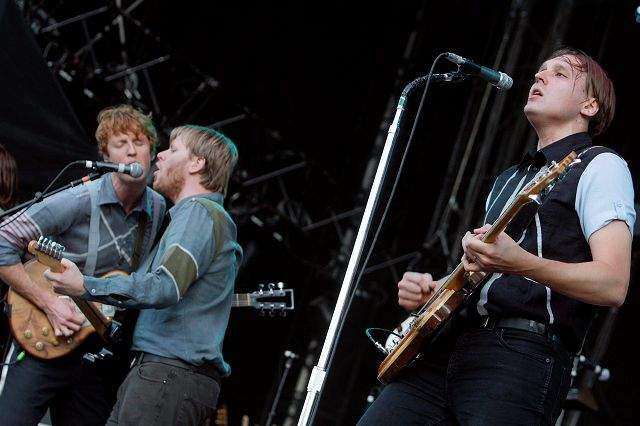 Edwin Farnham Butler III, right, singer of Canadian band Arcade Fire, performs July 25, 2007, during the 32nd edition of the Paleo Festival in Nyon, Switzerland. NEW YORK  Within hours of most any concert, shaky and distorted footage of the show can be found online from front row or the balcony. But online concert video has been steadily building toward live streaming, digital quality video and accompanying social media interaction. Unstaged, a new online concert series being launched by American Express, and to stream on YouTube and Vevo, hopes to combine all of these elements. As soon as we booked it, it felt a little ominous, Jeremy Gara, the bands drummer, said of the MSG shows. Playing there by itself is pretty exciting. Playing there twice seems pretty crazy, and then its our CD release and now this live broadcasting. Well, if were going to do it, do it big, Gara said. The concert will stream live at midnight MDT Aug. 5 on the Google Inc.-owned YouTube and Vevo, the music video site owned by Universal Music Group, Sony Music Entertainment and Abu Dhabi Media Co. Its the first in a planned series of five live streamed concerts, with John Legend and the Roots to follow, and others to be announced later. The series is planning interactive features like a choice of camera angles, one to be controlled by an as-yet-to-be-named director and another that a user can choose. Kelso said another option might be having viewers vote on song requests. Glenn Brown, YouTubes head of music partnerships, said the series was the video equivalent of the up-to-the-minute quality of Twitter. With everything being reproducible infinitely, being able to have that time-limited, unique experience is whats really interesting here, said Brown. YouTube has previously streamed performances at San Franciscos Outside Lands Music & Arts Festival and Tennessees Bonnaroo Music & Arts Festival. The largest Internet audience yet for a concert was YouTubes streaming of a U2 show in October, which was watched live by nearly 10 million. American Express and YouTube earlier collaborated on an Alicia Keys concert in December. Vevo was brought into the act for a stream in May of a National concert. When YouTube streamed the Keys concert, it noticed a spike in viewership when Jay-Z made a surprise appearance. The resulting social media buzz led to more viewers, a lesson that will be applied to Unstaged, which promises more special guests at the concerts.